As much as I loved living on the East Coast, the West Coast has been amazing since we moved here in mid-April. Here are 10 reasons why I love Redondo Beach! #1 Early morning bike rides on the beach. I love hopping onto my bike at 7 in the morning, pedaling down to The Strand or the Esplanade, smelling the ocean, feeling the breeze on my face and getting some exercise in at the start of the day. #2 The produce. 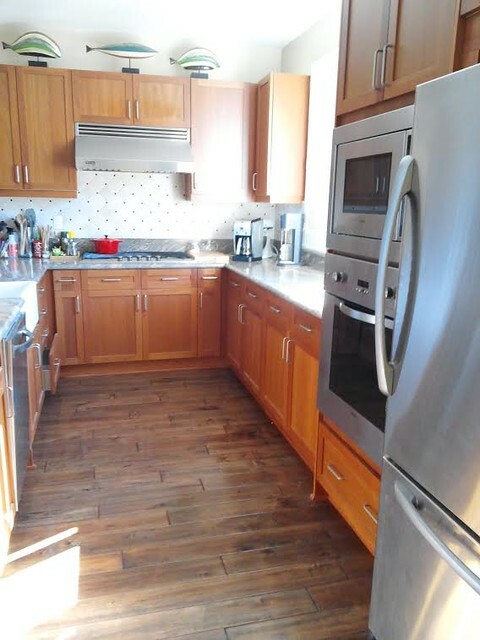 We’re surrounded by farmer’s markets, Whole Foods, Trader Joe’s and much more. And I can walk or bike to almost all of them! #3 The beer. We can walk to several restaurants nearby for good beer, including Redondo Beach Brewing Co., Japonica and Select Beer Store. At SBS, the walls are lined with craft beer in refrigerators. You can grab most for about five dollars and hang out for as long as you like. #4 The people. Everyone here is so friendly and relaxed! #5 The bus. Really! We are a one-car family, so having this option is great. The bus goes all the way from our place to LAX, every 20 to 30 minutes. It’s clean, the bus drivers are friendly and it’s convenient. #6 The restaurants. Pho Show, Veggie Grill, Hoka Hoka, Addi’s Tandoor and countless more, with plenty of vegan options. #7 Palos Verdes. This area is gorgeous! And just a few minutes away from us by car! Pelican Cove Park is breathtaking. #8 The views. We can see the ocean from our house! #9 Our kitchen. 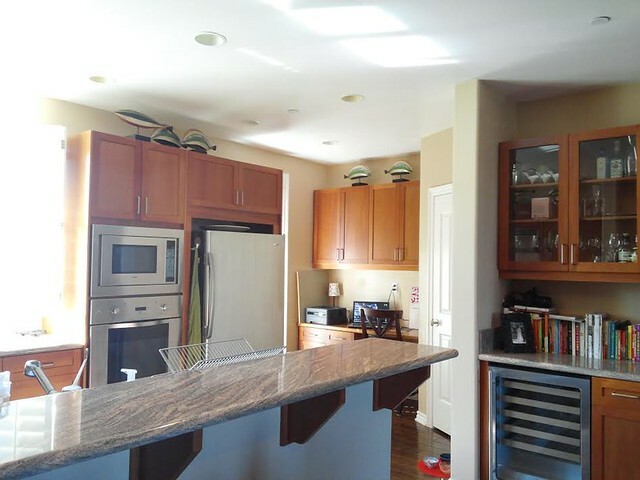 I love cooking and working in this space. A lot. #10 Our balcony. 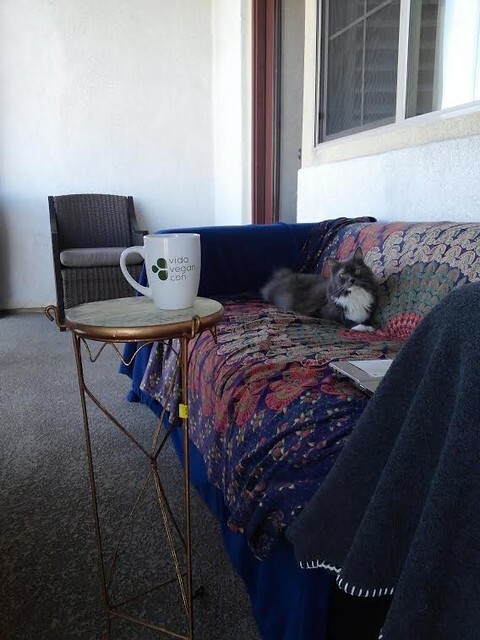 There is a little couch on the second-floor balcony that I hang out on most mornings with my cat, Nimrod and a cup of coffee. She loves the breeze and sticks her nose right up in the air to take all of the outside scents and aromas in. 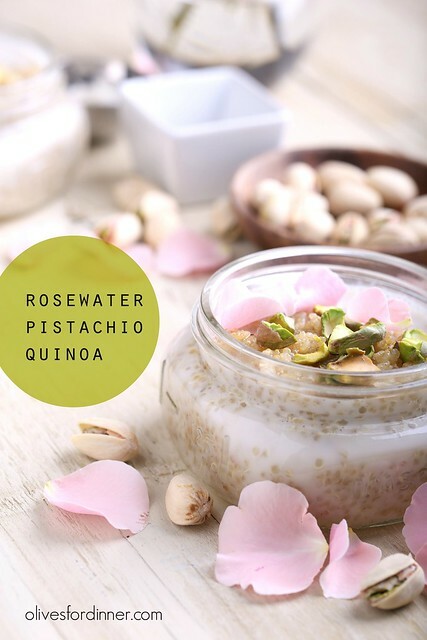 The other morning, I added a subtle scent of rosewater to the air with this rosewater pistachio quinoa. Best served cold, it’s light yet filling, with a hint of sweetness from the agave and cardamom. Place the quinoa in a fine-mesh sieve and rinse well under several exchanges of cold water. Place into a small sauce pan over medium heat. Gently stir around every 30 seconds or so until most of the water has evaporated, taking care that it does not start to stick to the bottom of the pan. This will give the quinoa a slightly toasted flavor. Add the cup of water to the sauce pan, cover, and bring to a small boil. Once a boil is achieved, reduce the heat back to its lowest setting, and allow it to simmer for 12-14 minutes. It’s important that you don’t remove the lid at all during this time, or you’ll end up with mushy quinoa. After 12-14 minutes, turn the heat off, but do not remove the lid. Allow it to sit on the burner, covered and undisturbed, for 10 minutes more. Now remove the lid and fluff very gently with a fork. Whisk together the rosewater, cardamom, salt, agave and coconut cream. Stir into the quinoa gently. Allow to cool to room temperature or chill in the refrigerator for an hour or overnight. Distribute the quinoa into two bowls and add a few splashes of almond milk. 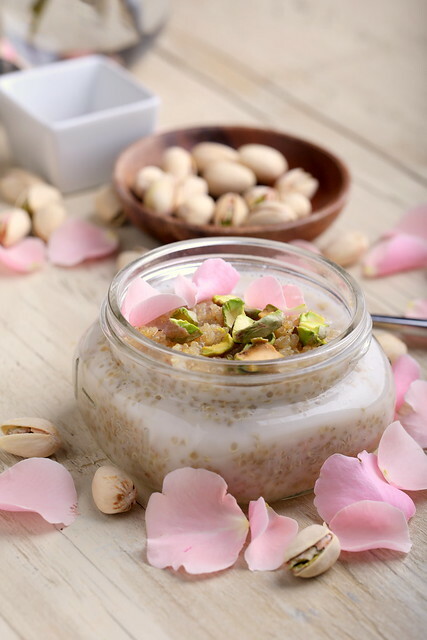 Top with the pistachios and any additional sweetener to taste and serve. Agree on all points! Produce, restaurants, friendly people, beautiful scenery! We're lucky to live in LA! Yep, so much to love here! these photos are gorgeoussssss. and i'm so happy you are loving california. i kinda want to move there. Thanks Caitlin, I love how Jeff shot these too! If you ever come here, I'd love to meet up!! Thank you for all you share on your blog, I am making this tonight! I bought a bottle of Rose Water recently and was waiting for just the right recipe to try. I love your blog I love your recipes and your photographs are as always absolutely outstanding! Thanks very much for your kind words … I hope you enjoy! 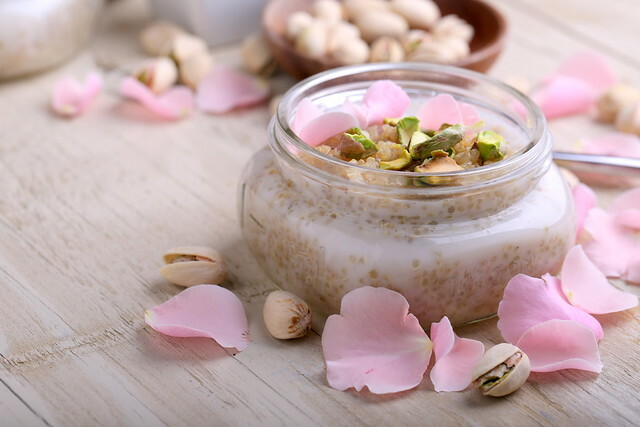 i definitely will be trying this recipe in my kitchen.. i never would have though to add rosewater to my quinoa puddings before. love the idea, thanks for sharing! que lindo poder vivir cerca de la playa .El mes que viene voy a estar visitando L.A asi que voy a tener una idea de lo que estas hablando. Espero que tengan una agradable visita a Los Angeles!